Give the piece a good sanding. This piece had old cards glued down to the bottom shelf and had some peeling. I scrubbed the old cards off and sanded it, as well as used some wood glue to adhere the peeling-it’s not perfect, but I am still very happy with how it turned out. I gave it two coats of Americana chalk paint in vintage. This is quickly becoming my new favorite. It is like a duck egg blue-very soothing. 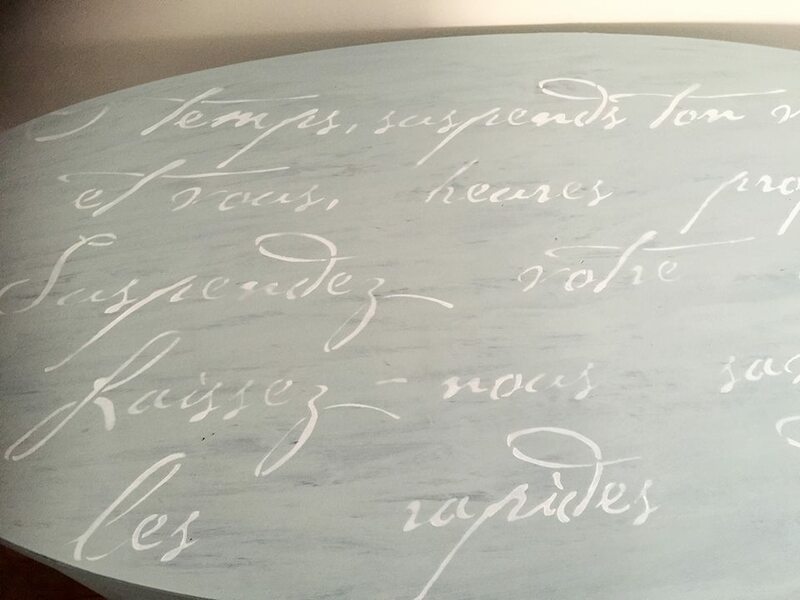 I used the gorgeous French Poem Stencil by Cutting Edge Stencils this is the most beautiful script stencil. I really think this table needed to be softened up a bit as it has very hard lines. 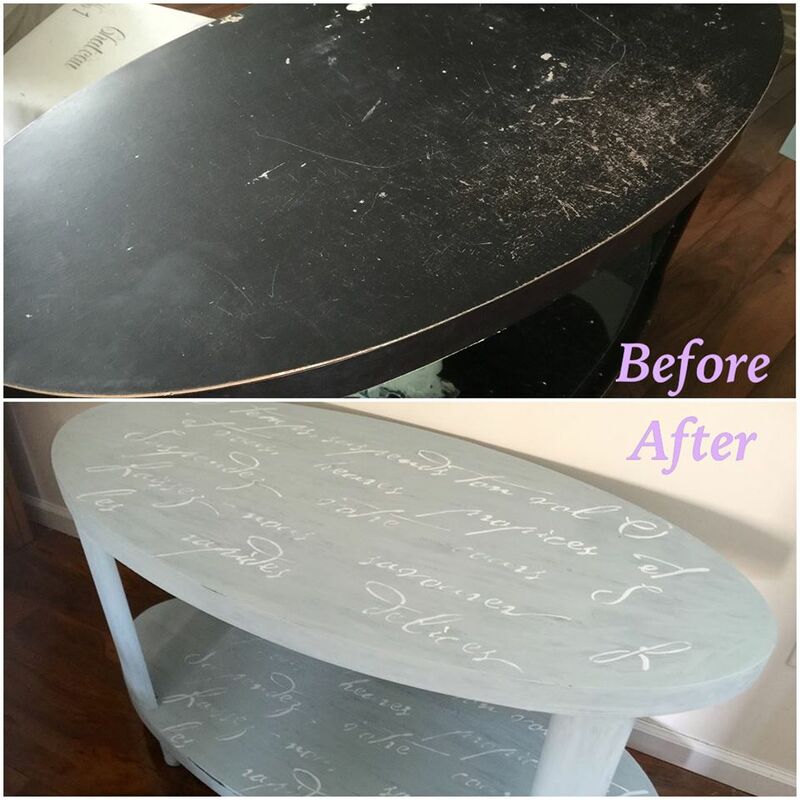 This stencil did the trick and the size of the stencil fit perfectly on the table! 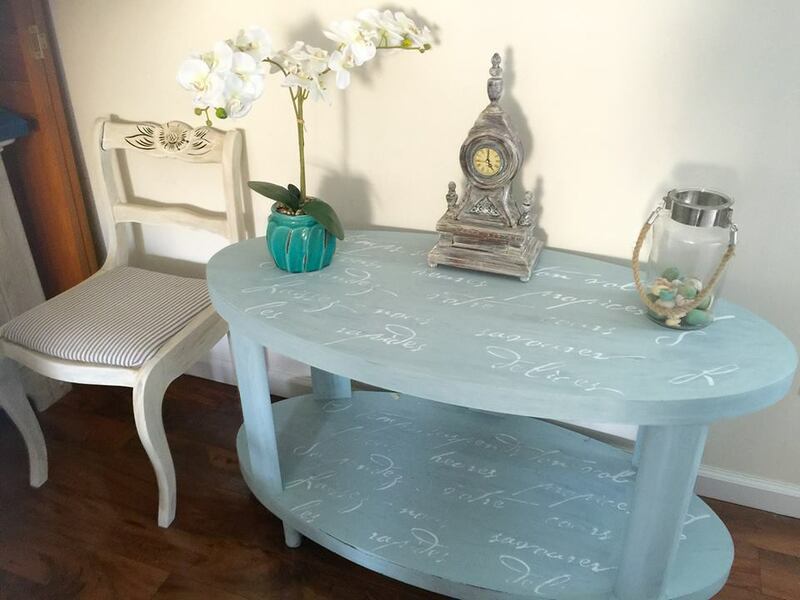 I used a nice pure white chalk paint for the stencil as I nice contrast. I finished it off with a clear wax. I know I say it all the time, but it is worth repeating. Don’t pass up those curbside finds! If it is a solid piece that is pretty much in tact, don’t let a few scratches stop you! It is amazing what a couple of coats of paint can do! Thanks Dad for taking time time to support my passion! I would love it if you would follow me on Social Media so you never miss a post! Have a great day! Wow, such a lovely transformation. It looks phenomenal. That is quite a transformation. I love the shade of blue that you used. That poem stencils on it truly make it look elegant too. This is a well done project! Thanks Crystal. I am enjoying co-hosting with you and am learning so much from you all! So true Mimi-definitely a Cinderella piece-that should have been my post title, lol! O wow! This turned out so pretty! I love the romantic feel of it and the color is delicious! I think the pieces that have the most “ugly” always turn out the best! Well done! I hope you have a great weekend! Thanks Terry. That is totally my new favorite color-it is like a Duck Egg Blue. 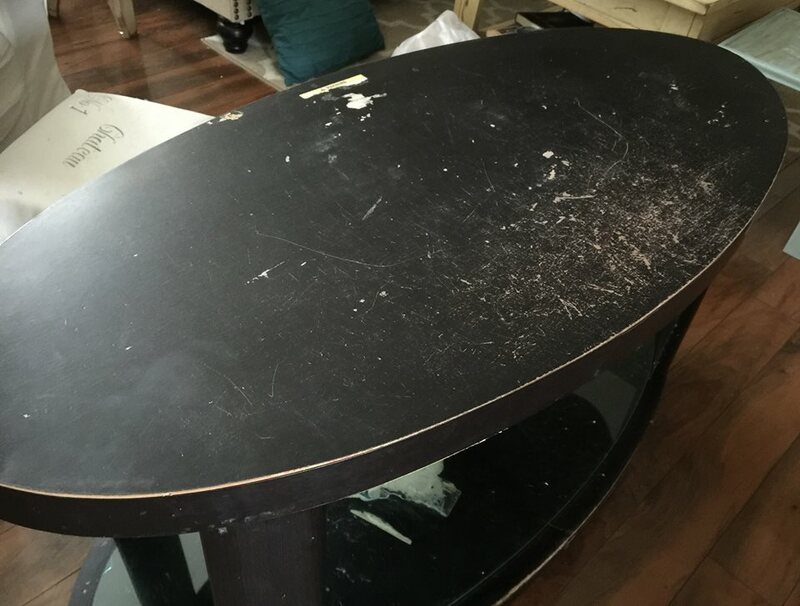 I had my doubts about this table, but I’m pretty happy with it. Love your party! I’ll say it worked~ gorgeous transformation Michelle! Thank you for sharing @Vintage Charm! Thanks for taking the time to comment Cecilia. Love your party! I love to refinish furniture-it is probably my favorite thing now. Love the feeling when you give something headed for the trash a new life! Wow, you really brought life back to that table! Thanks for sharing your creativity with the Thursday Favorite Things Blog Hop! Thanks so much for visiting Shellie! Wow! It’s beautiful, I love the script. I read this and you explain it so easy, makes me feel like I could do this too! It really is so simple to do-the stencil is beautifully made and there is no bleeding at all. The toughest part for me is not wanting to put it on every piece of furniture I own, lol! I am so like you Jeanne! I am 100% French Canadian and so wish I could speak it-such a beautiful language. I took 5 years of French and can barely recite the alphabet! France is on my bucket list of places to visit! Thank you! 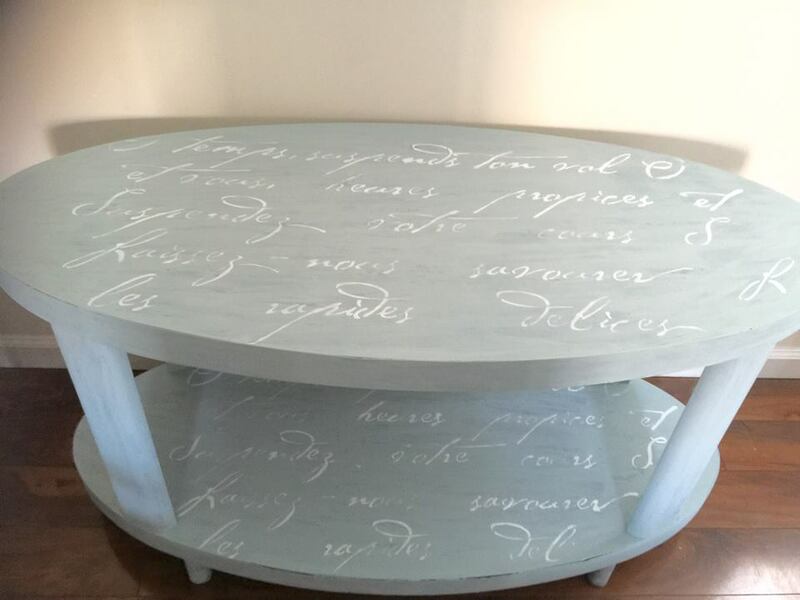 I love french decor and have a few stencils-even a Paris one which is one of my favorites. Her room must be beautiful! This is beautiful. You and I, along with the same name, also share the same interests and taste in decor. I love it!! Michelle, I have been wanting to reach out to you! 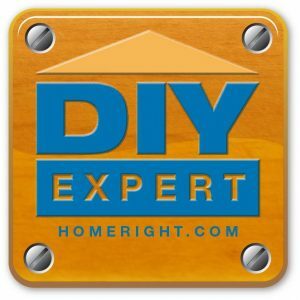 I co-host Home Matters & saw you are a contributor there! I started following you and can’t believe how much we have in common! James is my married name, but I have been Michelle James for 28 years. I saw we are also in the FFFC, which I just joined! I am so excited for the first one in April. 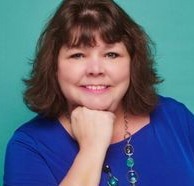 A very funny thing is when I went to buy a domain in January I actually looked up Michelle James Designs, then MichelleJDesigns and they were not available. I had no idea what type of blog it was. So funny! Oh my goodness, that turned out gorgeous!!! And my fav color!! I love the script on it…that adds instant style and flair to anything, I think!! It’s been a pleasure co-hosting with you at the #HomeMattersParty ! Thanks so much Rachel! I have enjoyed co-hosting with you and wish you all the best! Have a great weekend.